Screencasting iPad apps like Doceri record whatever appears on your screen and enables you to add a voiceover narration during the screencast recording or edit and add to it after the fact. 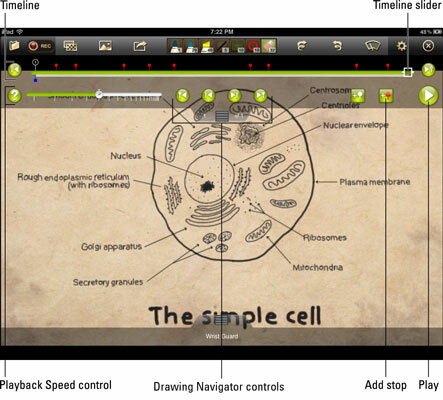 Screencast iPad tutorials are useful for extending course content beyond the classroom for flipped learning. On the opening screen, select the From My iPad Alone option. Tap the + sign in the bottom-left corner to start a new project. You’ll start with a blank whiteboard and a set of tools. If you are connected to a computer, you can tap the Background pattern icon on the top toolbar to open a new blank board. Tap the Background Pattern icon to select a background for your board. It can be a simple color, texture, map, graphing paper, or something else. 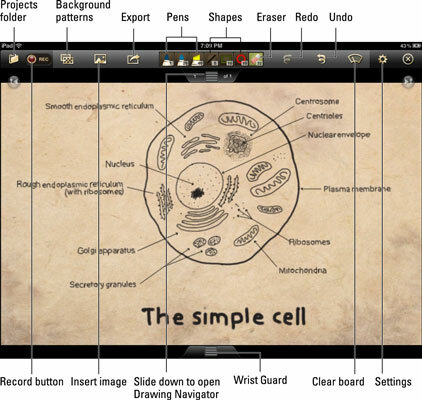 Use the tools along the top toolbar to write, illustrate, insert images, add shapes, and so on. Unleash your creativity! 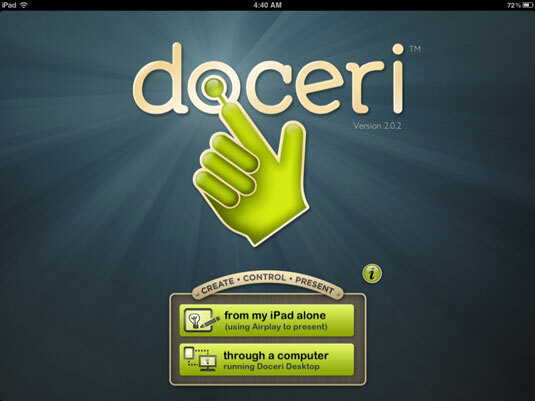 Doceri includes a Wrist Guard feature. When you slide up the Wrist Guard, it enables you to rest your wrist at the bottom of the screen without the app interpreting the touch as a drawing stroke. When you create a project in Doceri, it records each action you create in your drawing and it can be played back later as a presentation. You can replay all your annotations as they were written or reveal a section at a time by adding stops along the timeline. Tap and drag the Drawing Navigator slider down to reveal the timeline and other Drawing Navigator controls. The timeline enables you to see and access any point in your drawing. Drag the slider to traverse the timeline. Stop at any point in the timeline and make changes with the drawing tools. Tap the pushpin icons to add a stop in your presentation. The Playback Speed Control slider enables you to control the playback speed.